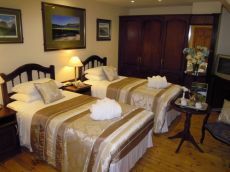 Our Luxurious two separate Twin beds at Ballybunion Guesthouse offer a great saving in cost for two people sharing a room with each having their own separate bed. For the guys planned a Golfing Trip or the ladies getting away for a few days this doesn’t come much better with full En-Suites comfort and style. Ballybunion Guesthouse offers room service, buckets of ice from reception, laundry service and ironing facilities for your relaxation and comfort in one of the best 4 Star Guesthouses in Ballybunion. We provide our guests with a secure golf club storage facility. Dying Room facility to ensure if the Golf Clubs or the Walking Gear gets wet then overnight in the Drying Room will have them ready to go the following morning completely dried. Ballybunion Guesthouse is ideally located so near to Ballybunion Golf Club and it world famous Ballybunion Old Course ranked in the top 20 of the world ranking for over 20 years. Ballybunion Town has so much to offer to see and to do. This makes the Ballybunion Guesthouse the perfect place to stay. David & Doreen Walsh look forward to welcoming you to Ballybunion Guesthouse.